Missed you guys!! I’ve had to go prowling around in the archives to figure out what in the world we talked about last! I think I was giving something away. Ah, yes! I was! Four of the Tawaf samples. Winners are Matt, Sam, TaffyJ and florentina. Click up there on the contact us, send me your name, address, remind me what you won. I’ll give you a quick reply once I read the e-mail so you know I got it, and then just sit by your mailbox until a jasmine leaps out of it and growls at you one day! Serge’s new release really wasn’t interesting me that much. Sandalwood. Yeah, yeah, Santal de Mysore. Rose. Okay, like that’s never been done. Well, it was intriguing, but it just didn’t sound like something really compelling or that different. They’d just bury the chocolate behind the rosebush and cover it with sandalwood. I read the story behind it. Serge wanted to do the sandalwood and rose, but thought that was a little cliched, done too often. And he couldn’t quite come up with the angle until one night when he opened a tin of cocoa powder. Now, I’m guessing everyone on earth has done that. The smell that comes up out of there is intoxicating. So I had some hope, but still pretty sure cocoa would get futzed up somehow, it usually does. Imagine my shock and surprise when I spritzed this little gem on and my eyes rolled back in my head. It’s got the spicy honeyed chocolate combination that leads to much sniffing, swooning and cavorting. I call it the “perfume crack” effect. Kerosene Copper Skies has it. There’s some deep happiness note nugget in there that whispers gourmand, then surrounds it with wood and roses and home. except, well, there isn’t. Not a masterpiece in his normal freak of perfumery way, but the warm honeyed feel to this that makes you want to lick your own arm, but never veering off into sweet is a pretty amazing perfumery stunt. This will be one of my wintertime go-to scents when I want to snuggle in and shut out the world and pretend that life is always cozy and happy. So let’s give some away! Four commenters will get a sample. Open mic Tuesday, talk about whatever you want – summer trash books you’re reading; how you’re keeping cool, if you are; how you spent your summer vacation, if you took one already. You pick, tell me stories! I don’t know if any of you noticed, but I did install another forum. Look up above. I wanted to just let it sit here for a few days and see if the spammers assaulted it like they did last time, which led me to take it down. So far, so good! I set it up so if those of you that comment here regularly and know each other want to arrange trades/swaps, bottle splits, you can do it in there. All the normal Caveat Emptor rules apply to swapping here and everywhere, and we aren’t responsible. Victoria has a great review of it. Oh, in case you missed it, I’m doing a Very Special Project. There are prizes! Take the survey, send me a wedding photo (this is optional), and you’re entered! I’m not reading trash this summer, I’m reading geology (Supercontinent: Ten Billion Years in the Life of Our Planet) and cosmology (Rare Earth: Why Complex Life is Uncommon in the Universe). Just because. I’m wearing trash, though, I guess: Body Shop’s Amorito, chocolate all the way down. I am really looking forward to trying Santal Majuscule because I like cocoa/chocolate scents, I like sandalwood scents, and I love Serge Lutens scents. Please sign me up! I could use a little comfort; I’ve got oral surgery today. Nothing serious but not particularly fun. Oh no, I hope it goes well and doesn’t leave you feeling like Musette did. Wear a lovely comfort scent today! What FWitch said! Make sure you do saline rinses – a lot! Mouths are germy little weasels! Seconding the good thoughts for you! Thank you all, it went well! I wore no scent because I was so afraid I’d never be able to associate it without thinking of major dental surgery. I’m doing allllll the rinses, and taking major antibiotics so the graft doesn’t fail. And taking lots and lots and lots of probiotics, to boot. I’m wearing a lot of Pacifica blood orange this summer. Yesterday evening was muggy and I was playing tuba at a band rehearsal in a small room with a lot of people, and it was good to smell the scent on my arms when I lifted the instrument. I didn’t even get to the blood orange. My mind stopped stone-dead on the tuba! That’s one of those where ‘lifted the instrument’ really means something!!! Chocolate and sandalwood sound delicious! I know what you mean by perfume crack,,,L’heure Defendue is one like that–if I wear it once, I don’t want to wear anything else the next several days–so addictive! My youngest son was bitten by a black widow yesterday, so we spent the evening in the E.R. Thankfully he is fine. The severity of a bite depends on how much venom the spider injects. It appears the spider only gave him a little nip. Whew!! School starts next week here in the South (do you believe it?!) and waiting around in doctors’ offices, school gyms, etc. has given me time to read Alyssa’s book, “Coming to My Senses” which I loved. Was wondering if y’all were going to do a swap this summer! Thanks so much for the Forum! As usual, I have a buncha stuff looking for new homes. Thanks for the great review, Patty! Oh, Sherri, sorry to hear that about your son but so glad it wasn’t too severe and he’ll be OK. I swapped for a decant of Prada Candy earlier in the summer and have almost finished it; that never happens, but it just smells so…good! It’s been so hot and un-airconditioned for me this summer that I haven’t felt like doing anything but rolling up in a ball, whimpering, and waiting for fall. I’m reading Elizabeth and Her German Garden on my new Kindle that my bff gave me. It’s written in the early part of the last century, and describes a time and place that haven’t existed in many years. The descriptions are lovely. It is finally feeling like summer here -30c/83F! About time. I wore Dzonghka yesterday and it was fab and the day before that I spent the day at Legoland and enjoyed Copper Skies all day. Today’s choice was a No. 5 Body Mist that was my grandmothers and I FINALLY GET THE LOVE FOR THIS STUFF. Clearly, I need heat for it to work. I sprayed from a decant of the EDT and no joy but the body mist is it. Just as well probably as its cheaper! I will definitely have to order a sample of Santal Majuscule as you have managed to push all of my buttons with this review, Patty. And, I adore that winter feeling of being snug and warm at home, with a stack of books, a full fridge and a bitter wind blowing. One of the things I miss most about living in England is being snug and warm an watching a snowstorm out the window. Peaceful and satisfying. I DON’T miss the aftermath of shovelling, clearing the car, getting plowed out, snow turning to slush though! And currently rereading Umberto Eco’s Focault’s Pendulum for the umpteenth time. On deck on my bedside table is Sarah Waters’ The Little Stranger. Also I keep dipping into Simon Schama’s Landscape and Memory which is fascinating. It was Landscape and Memory that introduced me to the work of German artist Anselm Kiefer – a revelation. Schama’s The Embarrassment of Riches is a great read too. Are you in San Diego? I was just about to write that it is finally warming up here and I see you said the same thing, plus mentioning Legoland makes me think you are. I am too! I’m in England, actually! Quite near to Windsor where we have a Legoland. Would love to visit San Diego as we have friends there! Ha! The Celsius should have been a giveaway! If you ever make it out here, would love to go sniffing (although there isn’t all that much exciting out here to sniff)! oh my…i was uninterested until you said COCOA. now i must sample it. I’ve taken to wearing Serge Lutens A La Nuit and to a lesser degree Montale’s Jasmin Full and stalking the Chanel website for no. 19 EDP. It always seems to happen when I have fun money, they are out of it and when I don’t have run money, they have it. Which reminds me to open my no 19 extract bottle and try that out. I’m taking a long weekend starting on Thursday! A group of friends and I are going up to a friend’s cottage in north Michigan. It will be stellar. Other than that, I’m just wilting away in the heat and wearing lots of fleur d’oranger, as always. Keeping cool, or attempting to, with some fragrant citrus: Annick Goutal Neroli, Tauer’s Cologne du Maghreb, and Zagara di Sicilia (orange blossom). Our “summer vacation” will be in the second half of September: Greece and Turkey! In the meantime, we’ve been going to the beach on Saturdays. Spending my time this summer unpacking and repacking in preparation for an interstate move in a month. All the books that were in storage from my days as an English major that I no longer even remember the plot of, all the glossy magazines that weigh so much (except my 20 yrs worth of Chocolatier magazines), all the things I don’t love enough to lug to another state, they’ve all got to be gone in 30 days. Eek! This sounds perfect right now. It is cold and foggy here! We will get our beautiful weather back in the fall. This is an eclectic summer of perfume. Today I’m rocking the Tauer Orange Star. I’m learning to love orientals in summer – I wore Le Maroc pour Elle the other day in the Texas heat and liked it more than I ever had before. Not doing a lot of reading but I am most of the way through my copy of Coming to My Senses. Patty, where is the link to this very special project? Oh, stupid WordPress killed it on me! I put it back in, it should show up as an embed now! I got a chance to sniff this on paper at the San Francisco Sniffa. The opening was all Lutens stew and I moved on quickly, but then accidentally came back for the drydown and WOW. Can’t wait for some cooler weather and a samp so I can try it on skin. P.S. Nice to see you back on here, Patty and I look forward to learning more about the Very Special Project. My summer vacation comes a few days at a time, as we are spending as many weekends as possible at a little campsite north of Lake Tahoe – far enough from the lake to be quiet and peaceful, close enough that we can hop over to the lake for kayaking or beach-strolling. I’ve found that Eau Illuminee is the right scent for the camp (pines on the edge of a high mountain valley with wide views) and am working my way steadily through the bottle. I’d love a sample of the Santal Majuscule – it sounds dreamy for winter! Well, the cocoa sounds like a fabulous addition to sandalwood and rose. Lately I haven’t been wearing as much of my Lutens collection – some of them have started to get a bit screechy on me, sadly – but I always love sniffing them. My favorite read this summer has been in audio form – The Rook, by Daniel O’Malley, which was fantastic. It has some themes that have become quite popular recently – the supernatural and preternatural, secret agencies, seemingly normal folks with hidden superpowers, etc., but done with a satisfying complexity of plot and lots of interesting twists. Highly recommended. This sounds wonderful; I do love that moment in the middle of baking when I open a fresh tin of cocoa and get the rich, rosy, spicy scent wafting around the kitchen. Right now I’m reading The Perfect Scent. Haven’t gotten far, as I’m in the middle of moving for graduate school, but I’m looking forward to diving in deeper in the next few days. I’m planning to read A. S. Byatt’s The Children’s Book again this summer – I love the complexity of it. You had me at spicy, honeyed chocolate! I hope this one is a little more gourmand on me than Jeux de Peau. Lots of people seemed to get snuggly awesomeness from that one, and all I got was pencil shavings. Santal Majuscule is already a big lemming, even without the positive reviews! This summer is all about mouchoir de monsieur, encens flamboyant, and my usual white flowers! Trash reads: mysteries…I’m loving Ben Pastor’s Martin Bora saga. Oooh, sounds yummy! It’s started to warm up here, so we’ve been keeping cool by turning on the room AC at night – which reminds me that I think I left it on today before heading to work. At least it will be cool when I get home! Haven’t been doing much reading lately. Read my first Christopher Moore book last month (A Dirty Job -highly recommended) – he is hilarious! No vacation yet, but I’ll be taking off the last week in August for both my and my husband’s birthdays. Going to go to Catalina for a few days, and I’ve never been so very excited about that! I sent my wedding perfume info/pic to you in response to the STC email, so hope you got it! Julie – I’m with you on the Christopher Moore recommendation – I found A Dirty Job incredibly funny. Reading “Babylon” by Kriwaczek, a wonderful history of Mesopotamia. OHHHH this sounds so delicious! Yes, maybe cliche, but…perfect. Thanks for bringing it to my attention (altho my bank account says–as it did to Musette recently–STOP!). Santal Majuscule sounds lovely, thank you for reviewing it, Patty. The SL I keep coming back to is Feminité du Bois. It’s the smell of warm sundrenched summerdays and a certain spot in the forrest where my siblings and I used to pick wild raspberries. We always came home with long scratches on our arms and legs. Another favourite is Boxeuses. Tubereuse Criminelle intrigues me but I only wear it once in a while and only when I’m alone. SL’s next opus is allegedly a take on gardenia – Une Voix Noire (A Black Voice) inspired by Billie Holiday. It could be interesting. A Billie Holiday-inspired fragrance could be really interesting…I’ll definitely be looking out for that. Thanks! I’ve been taking turns reading cerebral or nonfiction books followed by fun or even silly reads. So, after I finish re-reading C.S. Lewis’ Mere Christianity, I’ll read “Coming to My Senses.” I feel like this practice brings a balance to my downtime. So far so good after a couple months of it anyway. No trash books for me but I’m queuing a bunch of Johnnie To movies in my Netflix which I think counts. I’m still speculating that this fall’s Un Voix Noire will be gardenia-mushroom-patchouli. It probably won’t but a girl can dream! Good news is that the export and exclusive usually have a common thread so I hope it’s an earthy gardenia. But for now, I want that Lutens cocoa! Well, I’ve been sick as a dog for four days now with some really ugly upper respiratory something so I’ve only been spraying perfume on as a habit, not because I can smell a darn thing. But I have been reading! Big ol’ space opera, Leviathan Wakes. Pretty good, but long! I’m about to take my vacation to coincide with the Summer Olympics so you can probably guess what I’ll be doing 🙂 I’d love to be entered in the drawing for this, maybe I’ll be able to smell again by then! 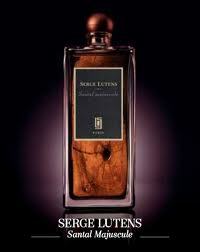 Love Serge Lutens perfumes – very interested in seeing what this one is like! I’ve been reading (rereading) Dorothy Sayers Busman’s Holiday. Great fun – I’ve always enjoyed the Lord Peter/Harriet Vane mysteries, especially the BBC version. This is all so romantic!!! Can I take the survey for what I wore when I was divorced? Pretty sure it was Mitsy, unless it was Mandragore. So predictable. OT, but I have a weird combo of scent strips lying on my desk right now: TF’s Grey Vetiver, D&G’s Dreaming in Portofino, Cartier’s Declaration, TM’s Alien and DK’s Golden Delicious. Somehow, this melange smells fantastic. I think it’s mostly driven by the Grey Vetiver, but the others are contributing something… I’m even willing to give the Alien (grape soda with an Irish Spring drydown) a tiny bit of credit. Just wish I were better at picking out notes, so I could identify a good layering strategy. After an early traumatic encounter with Angel years ago, I’m just now learning not to fear chocolate in perfumes. Would love to smell this new Lutens. I’m reading Gone Girl, which may qualify as trash, depending on your taste. Wowza, Patty! I’m definitely not the biggest sandalwood fan around, but you do make this sound pretty amazing. This just shot to near the top of my sampling list. As always, no need to enter me in the draw. Thanks! Every summer about mid July, I seem to become bored with my summer scents and embark on a quest for my HG. I used to think citrus lemon and grapefruit, but these often seem harsh and so short lived. So now it’s light summer florals as the theme this year. Zeta made the cut! And I’m still looking… It’s all in the quest, though, isn’t it?! That new SL sandalwood seems so nice and I can’t wait to try it when it cools down! I have recently fallen head over heels for Perfumerie Generale Indochine- I can barely stand to even put the bottle away- I feel like it is some magical concoction that I must constantly make sure has not escaped, obsessively returning to peek into the box to confirm no one has stolen my secret treasure! I have even given my dog the stink eye if she dares approach! Yes I am officially addicted! Thanks for the opportunity, Patty! I’ll have to agree with Ramona… Indochine is amazing! One of those addictive smells for me, I can’t get enough even in this 105 degree heat we had today. And I’m reading The Name of the Wind… science fiction, not my usual genre, but surprisingly good writing. I was interested given it’s sandalwood and a Serge, but this review has cemented my determination to try it. It sounds right up my alley. Thanks for the review. I have never tried a Lutens, but it sounds lovely…a perfect fall type of scent. Please enter me in the draw…thanks. Sandalwood isone of my favorite scents – and DH likes it too, which is rare! I’m reading some fiction this summer – _A Discovery of Witches_, for example, and Alyssa’s book is coming my way from Amazon (though that certainly doesn’t count as trash!) I’m having a floral sort of season and experimenting with gardenia based scents, along with my usual favorites (jasmine and magnolia). Mostly I’m just hoping to survive the hot weather and make it into my favorite season – fall! I think I missed my chance to sniff this at the Palais Royal last Monday. Clearly there is too much marketing in this world if it is true. I was at the Lutens boutique for my fourth annual “pilgrimage”. I arrived the day De Profundis came out last year, and this year it was still on display as the latest. I was so busy sniffing, but I think there was an ad – more like art at Lutens – on the wall for Santal Majuscule, but I ignored it! I don’t even pay attention to ads anymore! I thought it was an old Lutens. I just didn’t pay attention. In fact, it’s possible the poster was somewhere else, not at the boutique. My husband and I were looking at all the little moon carvings along the molding – each face is different – but if indeed there was a Santal Majuscule ad at Lutens it was lost on me. Too bad. Now I’m back here far from even export perfumes. It it sounds so delicious! Is it anything like Absolue pour le Soir? Thanks! After finishing all my other samples, I couldn’t put it off anymore so I finally decided to try my Angel EDT vial from Sephora. To my surprise, I actually liked it! I went back to my old sample of the original Angel and strangely, the patchouli doesn’t even bother me anymore (and I hate patchouli). Tastes really do change! This sounds sooooo good! I was also worried that it would be rose-sandalwood with maybe a hint of cocoa powder but now I really want to try! please count me in the draw. Reading: A Discovery of Witches (found it here! ), Lions of Al-Rassan, The Upside of Irrationality, Quiet, 2312, maybe some perfume books if I can get my hands on them. Also watching movies from the library. Recent faves: The Artist, Louder Than a Bomb, Young Goethe in Love. Looking at the project survey, not entirely sure how to enter as a singleton. Do I just say ‘what i wan to wear’ in the same comment box as marrieds would say ‘I wore’? and later when it asks if I still like the fragrance, what do I do? This sounds totally different than what I thought. I am very interested in giving this a try now. Cocoa. Yum. I can’t say I’ve done any trashy summer reading. The women at the office think I should read Fifty Shades. I think not. I’ve been spending time reading the blogs and lately I’ve been thinking of starting a blog for my husband’s company. They need someone to sort of take over some of their social media stuff and I think it might be fun. If that doesn’t work maybe I’ll think about a blog of my own. I think it would be a good challenge for me. So many lemmings, so little money. This one (Santal Majuscule), the Guerlain Deserts d’Orient trio, a couple of Amouages. And to think I asked my husband to hold onto my credit card for a while, because it feels like I’m spending too much. Oh wait, I am. To stay out of the heat, I went down to Pebble Beach last week to watch a horse show. I am amazed at how high horses can jump, especially when you consider how large they are, how much they weigh and the fact that they are also carrying a rider. Overcast and foggy every morning, warming to mid 60’s by midday. DH said it was 90 back home. He knows I don’t like weather over 75 degrees. Welp, I’m trying this now. Wasn’t even thinking about it before, but I love that addictive quality of Prada Candy, so now I must have this one. Thank you for the compelling review, Patty! What a great review, I can’t wait to try this! It seems like everyone is reading that 50 Shades book – I have no desire to, though. I do hair, and one of my clients, a lovely tiny 90 year old lady, came in to get her hair colored, clutching 50 Shades. She asked me if I had read it, and when I said no, she said that since everyone is talking about it, she thought she’d try it! I hope she enjoys it….. I am reading the 50 shades. Fun beach book, I think.